Currently hypertension is defined in two ways according to their causes: essential hypertension (or primary) and secondary hypertension. So this paper is devoted to the causes and risk factors for hypertension. 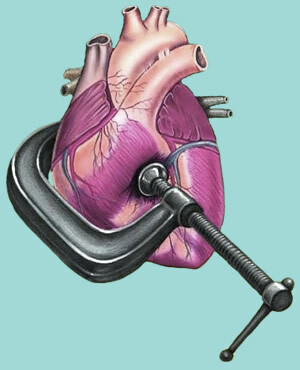 As has been mentioned in the introduction, hypertension has two types: essential hypertension and secondary hypertension. Essential hypertension, also called primary hypertension, is one that arises for unknown cause, whereas secondary hypertension is one that occurs due to such diseases as kidney failure, sleep apnea, hypothyroidism etc. The primary hypertension is the cause of high blood pressure in 95% of patients. Yes, that's right, virtually all cases of high blood pressure are caused by what we define as essential hypertension. It is not known exactly why the primary hypertension arises, but it is known that it is caused by multiple genetic factors and lifestyle habits. It is known that among the mechanisms responsible for the elevation of blood pressure in essential hypertension are increased absorption of salt by the kidneys, excessive response of blood vessels to nerve stimulation mediated by neurotransmitters such as adrenaline and a loss of elasticity of arteries, making them more rigid. Essential hypertension usually arises and gradually worsens over the years. Why these changes arise in certain people is still unknown, but we can already identify some risk factors for essential hypertension. Afrodescendant: yet it is not clear why blacks have a higher incidence of essential hypertension than other ethnic groups, but the fact is that not only African descent have more hypertension, as it starts early and usually causes more complications. It is believed that there is an interaction of genetic and economic factors behind this increased incidence. Blacks tend to have more sensitive blood pressure to salt intake, and due to inequality of our society there are many poor blacks, the quality of their food is usually poor, with high consumption of high-calorie foods and high in salt. Family history: a genetic influence on primary hypertension is well known. The more relatives suffering from high blood pressure you have, the greater are your chances of developing hypertension. People with at least one first-degree relative with hypertension are twice as likely to develop high blood pressure compared with those without a family history. Salt consumption: the essential hypertension is a disease typical of societies in the western world who habitually consume too much salt. People who eat more than 6g of salt per day (or 2.3 g of sodium) are at increased risk of having high blood pressure. The salt increases blood pressure by two inducing changes in blood vessels: a.) Salt (sodium chloride) increases the volume of fluid within the vessels as blood keeps high levels of sodium, kidneys absorb more water to dilute it, b.) sodium acts directly on the walls of arteries causing a constriction thereof, leading to an increase in the resistance (pressure) to the flow of blood and a reduced ability to vasodilatation. Obesity: Excess weight is another important risk factor for hypertension. Obese people (BMI greater than 30) are up to 6 times more likely to have high blood pressure than ones with BMI below 25. In addition to excess weight, waist circumference is also an important risk factor. The belly is not only aesthetically undesirable, it is also a risk factor for several diseases, including hypertension. Drinking: The daily consumption of more than 2 glasses of wine or beer, or the equivalent in any other alcohol beverage, twice increases the risk of hypertension. The greater the volume of regular ingestion of alcohol, the greater is the risk. On the other hand, moderate alcohol consumption, i.e., non-daily and not more than 2 drinks a day, seems to have no harmful effects on blood pressure. Age: the older the person is, the greater is the risk of developing hypertension. This is because over the years blood vessels are undergoing a process called arteriosclerosis, which is the hardening of the arterial wall, causing them to lose elasticity and ability to accommodate according to the variations of blood pressure. Hypertension in the elderly people is typically systolic, i.e. the maximum pressure (systolic pressure) is high and the minimum pressure (diastolic pressure) is low. High cholesterol: high cholesterol increases the deposition of fat in the arteries, a process called atherosclerosis. Atherosclerosis is a major cause of atherosclerosis, explained in the above topic. Sedentary lifestyle: Lack of exercise is another important risk factor for hypertension. A regular exercise reduces circulating levels of adrenaline, which causes constriction of the arteries and increases the release of endorphins and nitric oxide, which causes vasodilation. Moreover, the inactivity contributes to the increase of the overweight and cholesterol. Smoking: Cigarette smoking not only causes immediate increase in blood pressure by vasoconstrictor action of nicotine, but also accelerates atherosclerosis mechanism, leaving the vessels and hard drives. Secondly smoke is also a risk factor for hypertension. Oral contraceptives (OC): a pill usually raise blood pressure so slight, however, in some women, especially smokers over 25 years, the ACO may lead to hypertension. What has been listed above are only risk factors for hypertension, i.e., factors that increase the chances that an individual has high blood pressure. None of the above factors alone is capable of causing hypertension. As has already been stated, the mechanisms of development of primary hypertension are not yet fully elucidated. Unlike essential hypertension where there are risk factors, but no clearly established cause, secondary hypertension is by definition the one that has a well-defined cause. The patient has a disease that leads to hypertension. There are several diseases that can cause secondary hypertension, but all together only account for 5% of all cases of hypertension. It is important to note: 95% of cases of hypertension are primary. Unlike essential hypertension which usually worsens progressively, secondary hypertension usually has an abrupt onset, starting with already high blood pressure. As the kidney is the primary controller of the volume of water and sodium from the body, renal diseases are common causes of secondary hypertension. Below is list of the main causes of secondary hypertension. Specific texts for each of these diseases will be written later. Renal failure is a leading cause of secondary hypertension. When the kidneys begin to fail, the body finds it difficult to excrete excess salt and fluids consumed, leading to increased blood pressure. About 85% of patients with chronic kidney disease have hypertension. Importantly, renal causes rise in blood pressure, but can also be caused by hypertension. A high constant pressure usually causes damage to the vessels and the glomeruli of the kidneys and can lead to kidney failure. The patient then goes on to present a self-feeding mechanism: hypertension causes damage to the kidneys which in turn causes worsening of blood pressure. The more renal failure progresses, the more severe becomes hypertension. The glomerulus of the kidney is the neuron controlled from the brain. Glomeruli are the filters that are in charge of "cleaning" the blood. 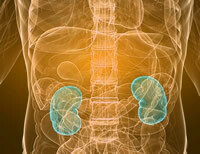 Glomerulonephritis is the group of diseases that cause inflammation of the glomeruli. Various diseases cause glomerulonephritis and almost all have hypertension as part of their clinical picture. The polycystic kidney disease is another cause of secondary hypertension. The expansion of the cysts causes an increased release of a hormone called renin, which causes further sodium absorption in renal tubules, thereby increasing the risk of hypertension. Patients with polycystic kidneys may have hypertension but do not present it even when detectable changes in renal function. Stenosis is the term we use to indicate a narrowing in an artery. The renal artery stenosis causes a reduction in intake of blood to the kidneys. As the pressure of the blood that reaches the rim is too low, this might think that the pressure is low throughout the body and passes salt and retains more liquids to compensate for this false hypotension. A pheochromocytoma is a malignant tumor of the adrenal gland producing adrenaline. This excess in adrenaline can lead to hypertension. A benign tumor of the suprarenal or an abnormal growth of the gland causes hypertension due to increased production of a hormone called aldosterone, which acts on the kidney to increase absorption of sodium renal tubules. Cushing's syndrome is a disease caused by excessive steroid in the body, either by overproduction of adrenal gland, or by excessive intake of synthetic corticosteroids for treatment of some diseases. The obstructive sleep apnea is a disease that occurs mainly in obese patients and is characterized by periods of apnea (no breathing) during sleep. 50% of patients have hypertension which is usually higher in the morning, unlike what happens in other causes of hypertension. Both hypothyroidism and hyperthyroidism may be present with hypertension.